Very large heads of double, lilac-blue flowers, opening from red-violet buds. 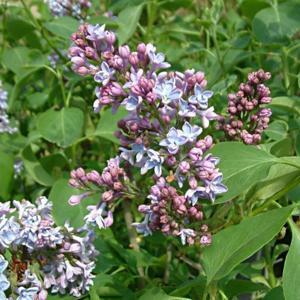 All lilacs are hungry and thirsty plants and should therefore be positioned with due consideration. They benefit from generous additional feeding. Can be pruned hard to rejuvenate in mid-winter. Remove unwanted suckers as needed. Some flowering may be lost after pruning as flowers are produced on two year old wood. From greenwood cuttings, by layering or grafting. Raised in France, about 1886.